Conference week is finally here, and after a short chat about the upcoming event, Lena Rodriguez joins Tim for an interview about her presentation that will be happening. 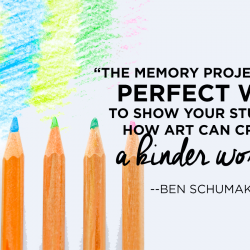 They discuss the responsibilities of the artists, how to teach students to find their artistic voice, and how these concepts can combine to help our students speak clearly through their work. Full episode transcript below. Tim: Welcome to Art Ed Radio, the podcast for art teachers. This show is produced by the Art of Education University. And I’m your host, Tim Bogatz. It is finally, finally conference week. I have been working on the Art Ed Now conference for months and months, been talking to you about it. Probably a little too much lately but the big day is finally here on Saturday. Now, I am two days away from heading up to AOEU headquarters to start making all of our last minute preparations and getting everything ready to go. And honestly, could not be more excited. I love putting on this conference. Couple times every year is a great experience and I just love seeing all the learning that takes place. But if you are listening to this on Tuesday when this episode comes out, you have two days left to go get signed up for the Conference. Thursday the 31 is the last day for registrations. So go get signed up at artednow.com if you have not done so already. And before we get to the interview today, I need to tell you about one of our platinum sponsors for the Conference, Nasco. 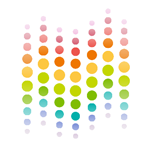 Now like AOEU, Nasco wants to help teachers create just engaging educational environments. And Nasco has the products you need, the solutions you need that can help you make this happen. And an awesome example of this is the mono printing plates. Just this incredible product that not only are they sending to everyone who got a swag box, they’re also providing a video with Susie Belzer that shows you some incredible techniques and gives you some great ideas on how to use the plates in your classroom. So make sure you check out their catalog to see all of the great things that they offer or check out their website at Enasco.com. That’s enasco.com. Okay, my guest today is going to be the amazing Lena Rodriguez. She’s the art director at the Grand Prairie Fine Arts Academy in Grand Prairie, Texas. She has presented at the Conference multiple times before and she will be back on Saturday with an awesome presentation about the responsibilities that we have as artists and how those responsibilities can guide the teaching in her classroom. So I want to talk to her about that presentation, give you a good preview, and also ask her about some of the other things that she has happened in her classroom right now because frankly, everything she does with her kids is worth talking about. So let me bring her on right now. All right. And Lena Rodriguez is joining me now. Lena, how are you? Lena: I’m doing great. Awesome. Tim: I am super excited to have you join me. And I wanted to talk about your upcoming presentation at the Conference. I know you have a lot that you’re going to be going over, but I think the biggest thing in your presentation is going to be talking about the responsibility of the artist. And I guess kind of boiling it down, maybe the idea of how what we teach needs to go beyond just technical skills in the art room. 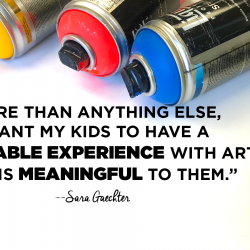 So I guess for people who are coming to the conference this weekend, can you talk about that idea a little bit more in-depth and kind of go into what kind of things you want to teach your kids in your art room? Yeah. So like you said we’re trying to, our kids technically the skill is there. It’s easy to teach. Well, I say it’s easy to teach. I’ve gotten maybe I’ve gotten a little too comfortable doing it. But ultimately what I want to do is aid in the process of teaching our students how to be good humans. Several years ago I lost a good friend and she was the youngest of twelve. And when I talked to her mother I asked her why so many kids. And she said that there is a lot of ugliness and awful things in the world and that she wanted to be somebody that could put some good out into the world. And I really took that to heart as an educator because I think we have a heavy hand in the types of humans that come out of our classrooms. And so ultimately my goal is to help them use their gift to invest in others and the world around them and ultimately to find joy in the process of doing that because everything else is fleeting. But when you start to help them become holistic artists, not just by skill or trade, but by spirit and mentality and add in the emotional impact. I think ultimately that should be the goal for a lot of us. Tim: Yeah, I think that’s a really good goal. And I actually want to kind of dive in and talk a little bit about how you get to that point. Because like you said we talk so much about skill and developing skill, but once you’ve done that a while you have that down. And so you start to look for new ways and different ways to kind of get your kids to talk about what’s going on in their lives and in the world. And I know one part of what you want to talk about is the artist working as a historian. Not just as it has to do with art history but also with history in general. We want kids to document what’s happening with their lives but also artists and our students have the responsibility to document what’s happening with the world around them. So I guess my question for you is how do you start to approach those ideas with your students? Lena: Well, fortunately, and it can be a good and a bad thing with the aid of social media a lot of students are already kind of in tune with some of the things that are going around in the world. Unfortunately, they get most of their news from Twitter or other websites where they just see 120 characters and they’ve made up their mind. So what I like to do, we research and we conversate about what we have learned not just from those threads, but from different news sites. And we learned about what’s going on and I tell them don’t necessarily make it a home situation. What’s going on in Texas or the United States or even North America. I want you to branch out. And they begin to do that and once they start going and digging out that little rabbit hole they just find themselves totally immersed in wow did you know this is happening. Did you know this was going on? And it brings so much, it’s a catalyst for them. Because they realize oh wow this is going on. And this is bad. But did you know this is going on? And it really sticks with them because many of them end up keeping up with those stories and see how those things become resolved and one of the things that I always have them do too is that okay, if you’re learning about them for instance, several years ago when the World Cup was in Brazil and they were tearing down all of these villages to build these stadiums. I had a student that was really upset about it. And like okay I want you to research the story of the people living in these villages and what they have to say about it. But then I want you to also research FIFA’s response to it. And I want you to research these towns and the local government in Brazil and their reason for validating doing what they’re doing. I want you to understand everyone’s points of view before you make your decision. And so that’s really what it is. I want them to research it. I want them to know it and if they’re going to be passionate about it they’re going to need to be able to respond to every push back from anybody that might disagree with them. And so kids love to be right. Who doesn’t, right? And so that really motivates them to okay I don’t really want to hear what this person has to say or what this entity has to say. But I’m going to put myself in their shoes and try to understand it from all of these different viewpoints before I make my statement. Tim: Yeah, and I kind of want to dive into what you’re talking about there a little bit more because I love the idea of turning kids’ social media use into a catalyst for art and helping them kind of find their voice there. And I think the social commentary is a big part, is an important part of that. And I know a lot of teachers kind of help their students approach social commentary through art kind of like you’re talking about there. But a lot of teachers don’t necessarily know how to get started with that or how to talk to their kids about that, how to turn that into an assignment, a project, something for kids to think about. So can you talk about maybe some of the projects you do with your students and through that how you kind of encourage them to be a voice for change? Lena: Sure. Yeah, so the social commentary project started a few years ago. It is my absolute favorite project. It’s one of the few that I repeat because as an art teacher I get bored if I teach the same things over and over. There are some things that are always going to be staples. And the social commentary has become that for me and it’s actually become something that my incoming freshman look forward to because they know the kids before they went through that. And they’re excited to do it. So we talk about how there’s been times where we’ve seen musicians and actors get political and a lot of times there’s always a backlash to that. A lot of times people will tell them, okay we don’t really just sing or just dance or just do whatever it is you do. And I always cite the example of the Dixie Chicks. And of course, you know, I’m from the south so that’s the first thing I thought of years ago when they had said something overseas that a lot of people didn’t like. Radio stopped playing their music and pretty much this really big robust career that they had started to dwindle because they spoke their mind on something. And was actually written a letter that they just needed to “shut up and sing.” And so we actually research what happened because even though that wasn’t that long ago, things have changed so dramatically especially in our country when it comes to social media when it comes to people stating their opinions on things that things just take off like wildfire. And so we watched the not ready to make a nice video which was their response as an artist, as musicians to these naysayers for what they had to say. And it’s very artistic. So we kind of start in with that. That’s kind of my hook. And then they can’t believe one, that they like country music. But these kids are in so much denial. And so that’s usually my hook. I like to talk to them about that story but how over the years and ages people have always gone to the artist to look at their work and to hear their opinions and it’s something that it’s highly favored and it’s something that’s highly sought out of. And I tell them that comes a lot of responsibility. And so after their research, I tell them your goal is to find your voice and you either with this artwork need to bring awareness to a situation and, or a call to action for a certain type of change. And so really the rest is up to them. I tell them okay, what is it that you need to hear or know. But most importantly what is it that the world around you, what do they need to hear and to know because if you don’t speak up maybe nobody else will or maybe other people are but there’s something about your voice and your piece and your story that really brings attention to something that’s out there that’s in me because we’ve learned that we can’t always trust what the books say. It’s usually written with the opinion of somebody else integrated into it. Several years ago we had an issue in the state of Texas where some geography books kind of, well I’m not going to say kind of, there are some history books that were really controversial and talked about how slavery was a job opportunity. And that was a really really hot topic in this area. And I remember seeing the book and I just was flabbergasted. And when I tell my students about this and they can’t believe that that was the booked that they learned from for a brief moment they’re like what are we supposed to do about it? I said well you create your work. You tell your story. Because we only know about what happened then because now we hear stories, we hear written tales, we hear songs and things that occurred and maybe that’s not always going to be what the history books tell us and maybe that’s not what’s always going to be documented. But there are multiple sides to every story and your job is to tell your story and tell your story to help somebody else. So whether that be something local with cyberbullying, something they deal with in their social circles or it could be the bulldozing of villages for the World Cup of Brazil or the Flint water crisis. It’s really truly up to them. Whatever it is that they find passion in, it’s really crazy because then you see all of these really cool conceptual sketches coming in that you have never seen with any other project or prompt that you’ve assigned. Tim: Yeah, I think a lot of teachers are surprised by that when it first happens to them. But I feel like we need to give our kids a lot of credit because they’re capable of so much more than we think. And they are deep thinkers. They are passionate about things and I think its awesome that when we give them an opportunity to do that they usually respond really really well. But I wanted to ask also just kind of the idea of telling your own story. I know you try and do a lot of that within your community. You want your kids to be community stewards you said with national art honor society and service learning. And things like that. You’re working on these projects that beautify the community that kind of leave a legacy. Is that something else that your kids are passionate about? Do they respond well to those ideas and respond well to projects like that? Lena: At first there was a hesitation with service projects only because it’s a non-paying gig. And once we turn these kids on to realizing that there is money to be made with their work, they became little hustlers. They’re like oh Mr. so and so, you said your anniversary is coming up. I bet you would love a portrait. These kids they’re going for that to go into okay now we’re going to go out and we’re going to do something and we’re going to do it for in return we’re going to receive smiles and hugs. There was a little hesitation at first but really honestly, it only takes that one event to cause that shift that mind shift of where okay this is actually really rewarding and I like that you use the work legacy because that’s something I tell them all the time. We are a new school. We’ve only been open for about five or six years and so I tell my students all the time we get to leave our mark. We get to start these traditions and we start this legacy because we have to leave our mark. The competition ribbons, they will be replaced with other ribbons. I always tell them, there’s always going to be a student a year or two after you that’s going to wipe out all those ribbons that you and those awards that you got and replace them with their own. And commission money, it’s going to be spent, but that moment that you feel when you utilize your ability to help somebody else, that seed that you plant, it’s always going to grow. And so it’s always going to be there. Nobody can take that away. And so once they understood that, it’s almost like we don’t even have enough service projects and the kids don’t even ask if there’s going to be any type of compensation involved in. And other things I also came across too, I work with a lot of my seniors in preparing them for college. And they talk about well I need to do this to get into school and I need to do that. And a lot of times they see organizations that national art honor society or national honor society things like that as oh I just need that label on there. I just need to show that I was a member. And a lot of us have become complacent with that. We’ve been okay with doing that where we do one or two service projects a year and we call it a day. And so but I want it to be more than that. And get them to understand that the equity and the value in that is not just that title, that association that the work that went involved with it and that most universities and scholarship committee are going to read that essay where you actually talk about what you did and probably not even notice that it was even listed in your resume. They want to know okay what was it. It wasn’t just a title. Anybody can get a title. But what did you do? And so that’s also a really good motivator for them because they’re very competitive. They want to get into the best schools and many of them need the scholarship money so a part of it can come from a selfish, okay this makes me look really good. But once they’re in it, you just have to hook them in. Once you hook them they end up falling in love with the service. Tim: Yeah, absolutely. I think that’s something that everybody who does service really finds. It can be tough to convince them at first but it always turns into something that’s really worthwhile. But I have a couple of other things I want to ask you about before I let you go. First off, I love following you on Twitter. I love seeing all the cool stuff that you and your kids are doing. I know you’re doing some mural projects. Some other things like that right now. Can you talk about those and maybe some of the other things that you have going on? Lena: Right now we’re looking at by the end of this school year, okay so we did a mural last year. And that was kind of a rush. And so we knew this year we wanted to do more and by the end of this academic school year, we will have probably done as of right now, seven or eight. Lena: I know, right? And I’m somebody that always shied away. I did not want to do murals. The first several years that I was teaching, oh you should do a mural. No. You should do a mural. No. But then I thought you know what it’s time to bring something new. It’s time to do something different. I’m a huge supporter of learning, being a life learner and not just teaching what I know now, but learning more things so I can teach those things. And so instead of just working with a small mural, we decided to do this 800 square foot mural in my home town. And it was on corrugated metal. We did it in 36 hours around the clock. And again, kind of like with the service projects we were hooked. And so basically what we do, we have people that approach us occasionally but the most part we go out and we reach out into our elementary schools in our district. Especially those that maybe their students don’t have really a lot of access to art or public art. I’m proud that our district has at least one art teacher in every single campus. A lot of districts especially in Texas don’t have that anymore because of funding issues. We do that. And have that at GPISD. But still with things like public art and stuff like that we have a lot of kids that are low socioeconomic that don’t really get to leave their neighborhoods that much to see that stuff that we want to bring it into their schools and so we’ve done a lot of murals within elementary schools and hallways there. And their libraries and things like that. And fortunately, it’s taken off to where different people in the city have taken notice of it. And we’ve been getting approached more lately. We just found out yesterday that we were offered it’s about a 1400 square foot wall. The biggest one we’ve ever done. Lena: And a year ago, as I said, I did not want to have a mural program. But now we have a full-fledged. Like we had to come up with a name for it. We have so much fun. And it’s great on the kids resumes. They learn so much on site. And most of these murals, like these smaller murals, we get them done in one day. So we did one on MLK day on Monday at a local elementary school. We started at 8 AM, we were done, cleaned up, everything by 6:00. And it was a full wall. And it was about 22 feet wide, about 12 to 14 feet tall, and just hearing from different teachers and people who’s students go to that school yesterday reach out and said oh my gosh. My kid talked about this mural all day. They didn’t want us to pick them up. They said mom you need to park. We need to take a picture in front of it. And that’s what we wanted. We want them to get excited. We want them to be touched by the art. 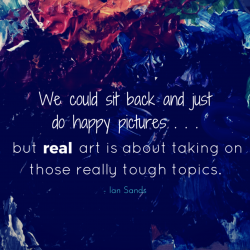 And let’s be honest, especially in public education we have to stay relevant as artists. We have to let the community and those around us that vote on important issues be exposed to art and say yeah this is making our community better. This is putting value into our school and value into our young people. And so really that’s kind of what’s driven us, not just the idea of leaving our mark everywhere, but knowing that we are keeping something so precious and so important like the visual arts relative to education today. Tim: Yeah, that’s a great point. And I love just all of those ideas. Like helping kids take pride in not only what they’re doing but passing that on where you’re creating these murals and like all of those elementary kids now all of a sudden have so much pride in their own school because of that. And I think that’s just an amazing thing. Okay, we do need to wrap it up here. But I do want to ask you one last question. I want to talk about the conference just a little bit since we are so close. You’re kind of a veteran presenter at this point. I think this is your fourth time presenting now. Tim: You’ve done a lot. So I just want to ask you what do you enjoy about the Conference experience and when you’re going time after time what do you try and take away from the day? Lena: The conference is a breath of fresh air. There’s a lot of jokes and comments that can be made about professional development that’s usually offered to us. It doesn’t normally always hit that mark or fill our love tanks especially specials teachers. But what I love about the art of ed is that it’s exclusive to people that do what I do and not just at the secondary level but also I learned so much from the elementary presenters as well in the topics with that. I learn new techniques. I learn new ways of presenting things. I get to download documents and forms that somebody already put hours and hours of time and effort and research into that I can use in my studio and in my classroom. And I love that I get to do this in my pajamas. And if I miss something I can go back to it and revisit it again. And honestly too networking, I’ve gotten to meet through this social media sphere world that we live in all kinds of great educators from all over. Getting ready to probably contact them directly to do some type of collaborative project with them either it is via the interwebs or maybe we’ll hop a plane and bring some kids their way and make a connection that way. So I love just about everything about it. Art of Ed has truly changed how I view things as a teacher. I’ve never a lot of times as teachers sometimes we feel like well I’m just a teacher. Or we know all the work that goes along with it. But when you have friends that are doctors and lawyers and accountants and ad managers and things like that Art of Ed makes me feel like a true professional. And these conferences really make me feel like I am part of a community that honors and values what we do every day in the classroom and the studio and at home after we tuck our kids into bed and keep on grinding out some work. Overall, I take a lot away from it and I love it. I look forward to it every time the conference comes up. Tim: That’s awesome. I feel like I don’t even need to convince people to go. I feel like you’ve done my job for me right there. That’s awesome. Lena: I will find them. We’ll talk about it. One on one. Tim: Nice. That’ll be good. Now, I think that’s awesome and I think those are all reasons that people love doing this conference. It’s why I love putting it together. I feel like there are so many connections that can be made and so much that can be learned and so I’m really glad to hear how effective it is. So we’re really looking forward to seeing your presentation and hopefully, we can have you back on the podcast again soon. So thank you. Lena: Thank you so much. Tim: That was an incredible conversation with Lena. 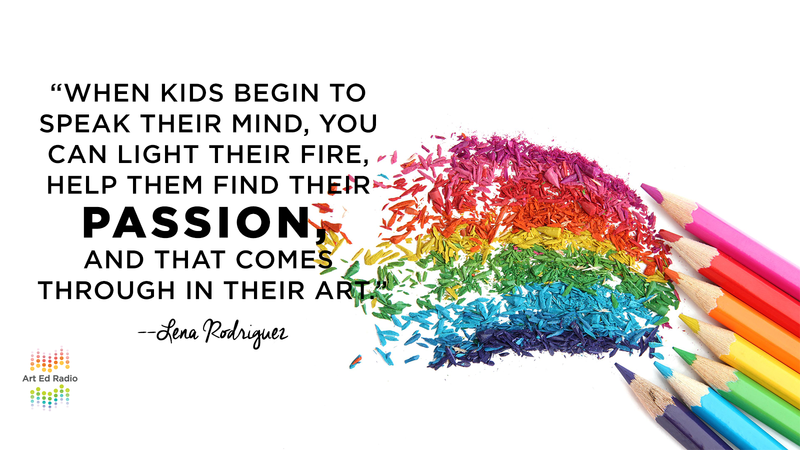 Just so many great things to say about teaching students how to find and how to use their artistic voice and teaching them about the responsibilities that we all have on artists. And I can’t believe that I’ve never had her on the show before. That is a big mistake on my part and we will have to have here back again sooner rather than later. But honestly, I don’t know how you can listen to her talk and not want to see what she has to say and her presentation on Saturday. So I hope you are going to join us and as we think about things as we get ready for the Conference I want to highlight one thing she said right at the end there about how this conference on Saturday gives all of us the opportunity to feel like professionals. And we talk all the time about how our PD at school is not for us. And how we are disrespected in our building and in our district and how we are all alone on our proverbial art teacher island. But guess what? Saturday is your chance to change all of that at least for a day. 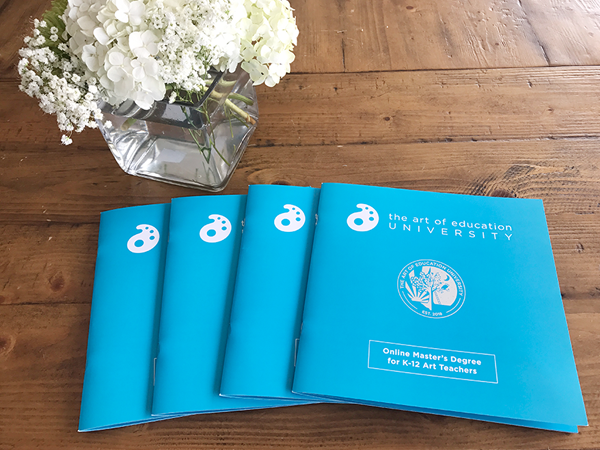 When you’re at Art Ed Now, you are with art teachers from around the world that are speaking your language and sharing your concerns and most importantly dealing with each other on a professional level. And that’s what makes the day so great. And that’s why you need to be there. So I hope that we’ll see you on Saturday. Art Ed Radio is produced by the Art of Education University with audio engineering from Michael Crocker. Like I said we really want to see you at Art Ed Now this weekend so if you are coming, make sure you are using the Art Ed Now hashtag to share what you’re doing and the Art Ed Now swag hashtag to show off all of the goods from your swag box and how you’re using them. And if you are not registered go do it now. Open up your laptop, pick up your phone, whatever you need to do. Go to artednow.com and get registered before the Thursday deadline. We will see you there on Saturday and we will talk to you next week with a conference recap episode. Thank you.